Gutters are an important part of all roofs. If your gutters are old, rusty, or leaky, then you should try and have them replaced as soon as possible. Brisbane’s Northside experiences relatively frequent rain and during summer, heavy deluges are sudden. Without effective guttering, you home could sustain water damage. Here at Strongguard, we have been working with roofs and guttering for over twenty years. We have a lot of experience when it comes to gutter replacement. Our team specialises in installing new high quality gutters on all types of roofing. We offer gutter replacements for domestic and commercial buildings. All of the products that we offer are Australian made from BlueScope Steel. This means that they are built to meet Australian conditions. When you compare this quality, with Strongguard’s industry leading installation, you get the best quality guttering in North Brisbane. Gutters might seem like a relatively simple installation, but there are actually a few things to consider. Gutters generally last about thirty years. To function correctly and last this long, they must be angled correctly. The angle of the gutter determines how well it can drain water. If the gutter doesn’t drain water effectively, then water will pool within it. When water sits like this for long periods of time, it creates rust and your gutters will have to be replaced. In addition to this, you must also choose the correct profile. The wrong profile of gutter for you roof will result in overflows. Here at Strongguard, we can prevent all of these issues. 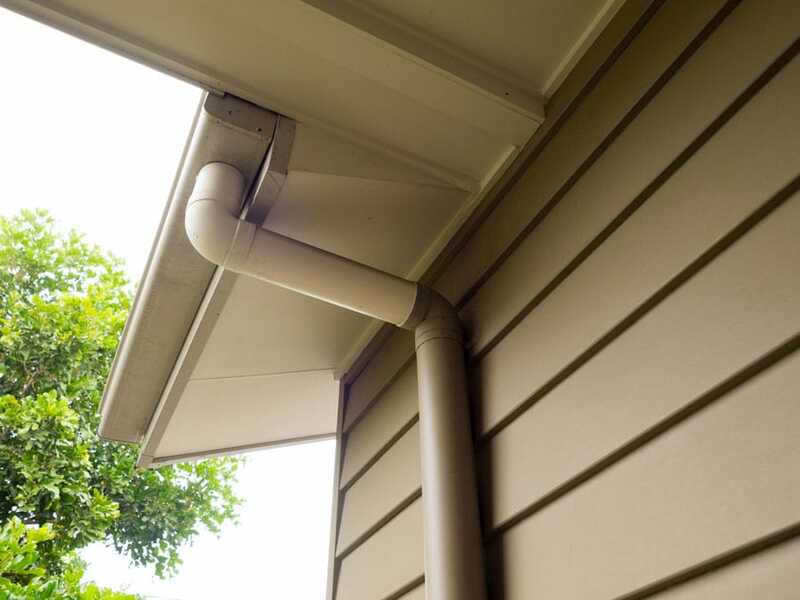 When you get a gutter replacement for your North Brisbane home, we make sure everything is done correctly. Our team has a lot of experience. This means that we are able to match the right gutter profile and angle to your roof. As a result, a gutter replacement will ensure that your gutters drain your roof effectively in any weather. There are many things to account for when installing a new gutter. That is why we have developed a specific process for all of our gutter replacements. Our process is designed to identify all of the relevant features of your roof, before crafting the ideal solution. Our experienced estimators will measure your gutter, to ensure minimal wastage. This also allows us to make an accurate quote for you. Our tradesmen will arrive at your house and set up all of our safety equipment. This typically includes scaffolding guiderails and work platforms. Once these have been assembled, we will remove all of the old and damaged guttering and downpipes. Following this, we will set the gutter falls using a stringline and level. We will then install the new brackets. Depending on the guttering profile, these may be coloured spike brackets, or internal concealed brackets. 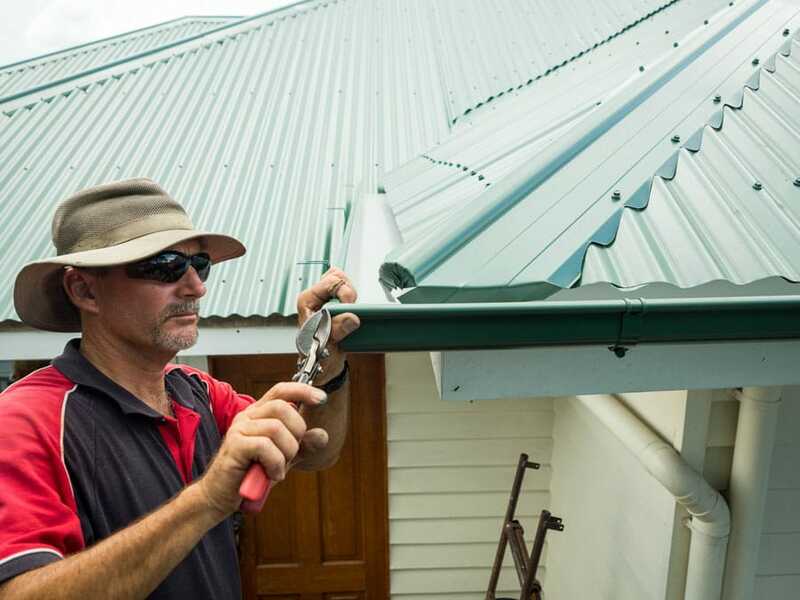 We will source high quality COLORBOND® steel guttering before we commence on your job. This means that it will be ready to install when work commences. When we install your new gutters, we will ensure that all joins and corners are pop riveted and undersealed. By doing this, we allow for the expansion and contraction of the installation. This is vital, as hot and cold temperatures can cause expansion and contraction. If the guttering is not prepared for this, the joints can leak. Once the guttering is in place, we can connect the downpipes. All downpipes that we install are COLORBOND® steel or PVC, for optimum durability. We will then connect these downpipes to either your rainwater tanks, or stormwater drains. Any old materials that are left over will then be removed and disposed of, leaving your home clean. We always use new accessories, which means that we will also dispose of old spikes brackets and outlets. If you can see signs of rust, blockages or general deterioration in your gutters, contact Strongguard. We offer all the gutter replacement services you need to turn your old guttering system, into a brand new one. 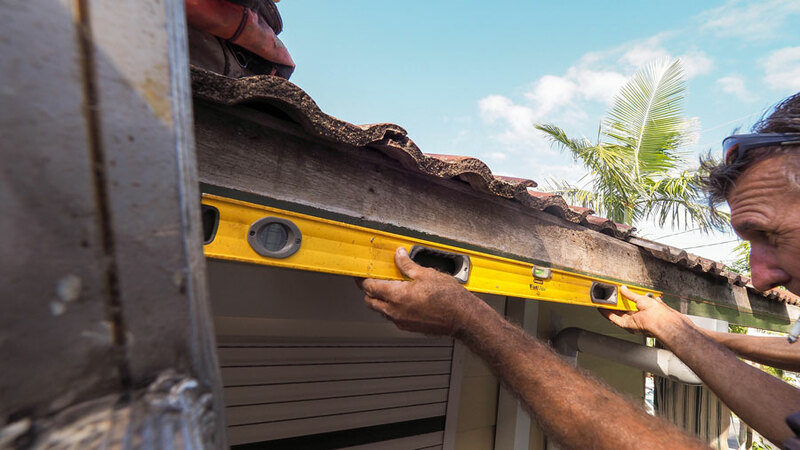 For the best gutter replacements in Brisbane’s Northside, give us a call. You can reach us in our office by phone, or you can contact us through our website at your convenience. #1 Do you suggest replacing all the guttering when it is only rusted in one section? Normally rusty guttering is evidence of an underlying issue, even if the rust is only in one area. This could be an issue with the age, profile or fall of the guttering. In any case, it is usually a good idea to replace the entire gutter in the one go. #2 Can you re-fall my existing gutters? We can re-fall your existing gutters, but we don’t normally recommend it. Re-falling gutters takes almost all the work of replacing them altogether, but without the advantage of a new COLORBOND® steel gutter. For this reason, we suggest replacing your gutters if you need to re-fall them. #3 My gutter is leaking between the house and the deck – can you fix it? Leaks between houses and their decks are one of the most common issues we have to deal with. There are a couple of good solutions for this, including new flashings and guttering. For more information, get in touch with our team. #4 My gutters are extremely high – can you reach them? At Strongguard, we specialise in gutter replacements at any height. We have access to all the right scaffolding, elevated work platforms and booms. This allows us to access any job, regardless of height. #5 Do I need more downpipes? This depends on the design of your house. Some homes built before stormwater have inadequate downpipes and need extra installed. Others have incorrectly falling gutters that don’t drain properly. Our estimators can give you better idea of what you issue might be.